Definition at line 63 of file DiagnosticOptions.h. Definition at line 68 of file DiagnosticOptions.h. Definition at line 65 of file DiagnosticOptions.h. Definition at line 117 of file DiagnosticOptions.h. The file to log diagnostic output to. Definition at line 92 of file DiagnosticOptions.h. Referenced by checkVerifyPrefixes(), clang::CompilerInstance::createDiagnostics(), and SetUpDiagnosticLog(). The file to serialize diagnostics to (non-appending). Definition at line 95 of file DiagnosticOptions.h. Referenced by checkVerifyPrefixes(), and clang::CompilerInstance::createDiagnostics(). 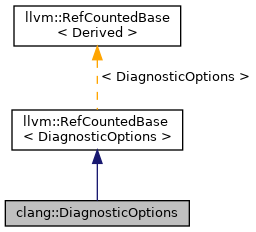 options used to alter the diagnostic mappings, with the prefixes removed. Definition at line 103 of file DiagnosticOptions.h. Referenced by checkVerifyPrefixes(), and clang::ProcessWarningOptions(). The prefixes for comment directives sought by -verify ("expected" by default). Definition at line 107 of file DiagnosticOptions.h. Definition at line 99 of file DiagnosticOptions.h. Referenced by checkVerifyPrefixes(), clang::CompilerInvocation::CreateFromArgs(), and clang::ProcessWarningOptions().